Fish oil is rich in omega-3 fatty acids and has been known to improve cognitive abilities and protect the heart—but do you know about the amazing benefits fish oil has for the joints in the body? In 2009, a study was published in the Italian journal La Clinica Terapeutica and it indicated that omega-3 fatty acids can improve symptoms that are associated with rheumatoid arthritis (which causes joint inflammation and pain in the knees, feet, hands, and hips) and reduces the need for pain medication. And you don’t have to be an athlete to receive these benefits—seniors who enjoy walking as a way to keep healthy will also find the reduced pain and inflammation beneficial while exercising. • Decreases inflammation: Inflammation is just one of the symptoms of arthritis—inflammation can also occur if you sprain your knee, stretch it incorrectly, or even dislocate it. Inflammation makes it extremely difficult to bend the knee, and research shows that consuming fish oil is a great option for reducing the inflammation. In a 2011 study published in the journal Phytotherapy Research, researchers discovered that consuming omega-3 fatty acids can decrease inflammation in the joints. • Pain relief: Fish oil is effective at easing pain in the muscles around the knees. In a 2009 study published in the Clinical Journal of Sport Medicine, researchers discovered that consuming omega-3 fatty acids can help relieve pain within 48 hours after exercising. • Cartilage protection: Did you know that consuming too little omega-3 fatty acids can contribute to cartilage loss in the knee? Having a good balance of omega-3 and omega-6 fatty acids is essential to keeping cartilage from decreasing and preventing bone marrow lesions from occurring. 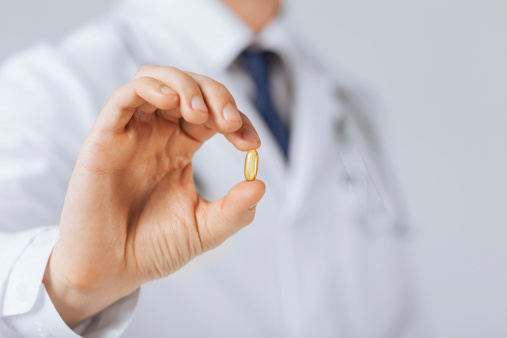 In a 2008 study published in the journal Osteoarthritis and Cartilage, researchers concluded that more fish oil should be included in the diet to keep the accurate balance of fatty acids. Bonus Tips to Improve Your Joints! • Stretch before any activity: Your joints and muscles need to be properly warmed up and stretched to avoid potential injuries. • Never overdue it: When you are exercising, it’s ok to push yourself, but if you feel extreme pain and cramps, take a break. • Diet: Your joints, muscles, and bones all need proper nutrients, especially if you are putting them through physical activity. Ensure that your diet matches your activities—and incorporate fish oil. If you are experiencing pain or inflammation in your joints, it is important to consult your doctor or medical practitioner for a checkup to make sure it’s not a more serious issue. Wolf, N. “Will Fish Oil Help My Knees?” Livestrong.com, March 23, 2014; http://www.livestrong.com/article/490934-will-fish-oil-help-my-knees/. Murphy, T.J. “Why Should Runners Take Fish Oil?” Competitor.com, February 4, 2014; http://running.competitor.com/2014/02/nutrition/lets-talk-fish-oil_23193.